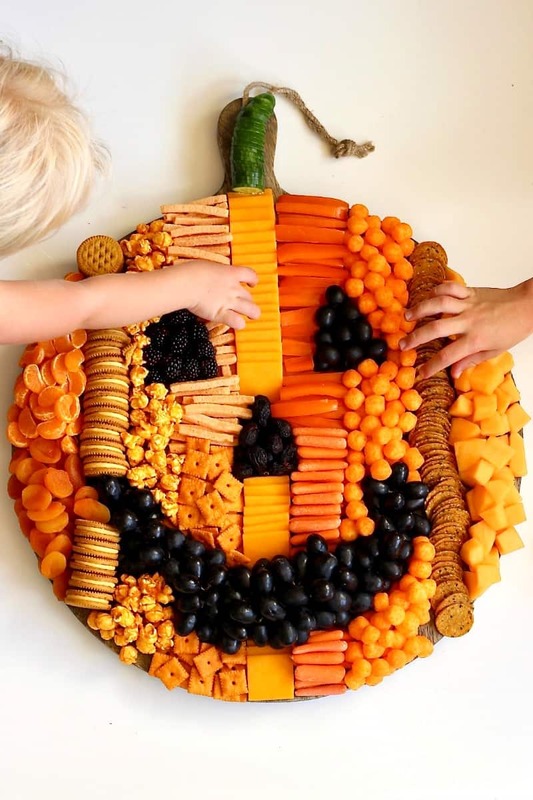 How to build an adorable and delicious Pumpkin Snack Board for a Halloween or fall party that is sure to WOW your crowd! 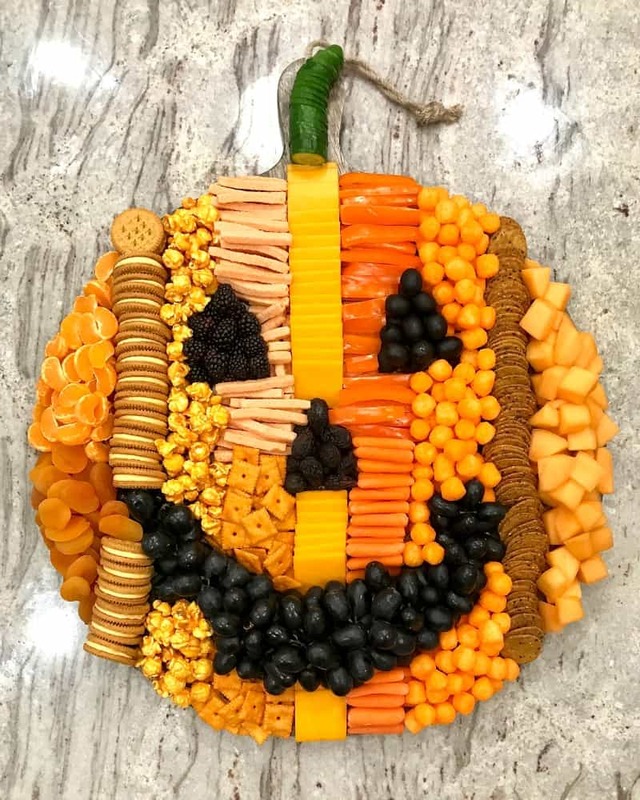 This Pumpkin Snack Board was such a huge hit that I just have to share all the details on how I built it so you can build one too for your family and friends this fall! If you know me or have been following me on Instagram, you know I’m obsessed with boards. 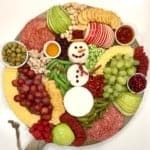 Whether is be a weeknight brinner board or a festive holiday board like this pumpkin snack board, I’m always thinking of ways to serve our meals/snacks on a board. 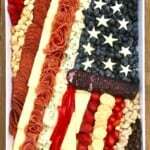 I love building them and my family and friends love eating off of them. So much fun and yum! 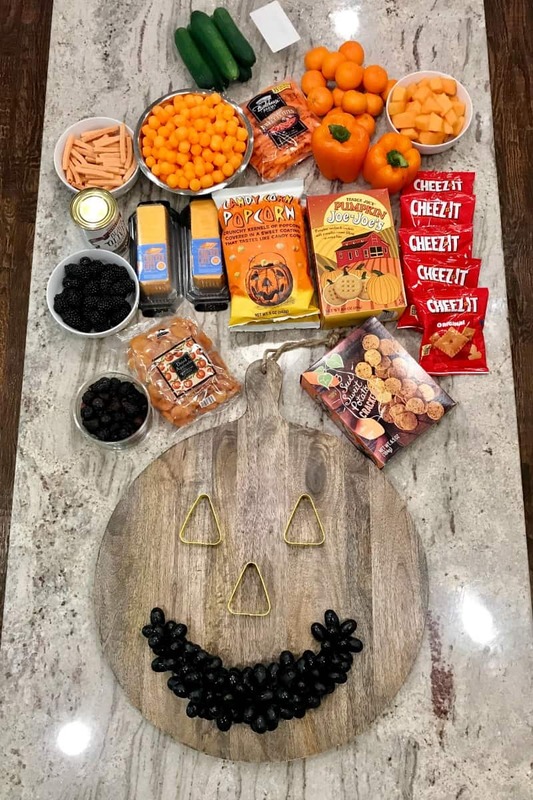 I used my 20-inch round Mango Wood Board from Sur La Table and it worked so perfectly for the pumpkin shape and amount of snacks I wanted to serve. 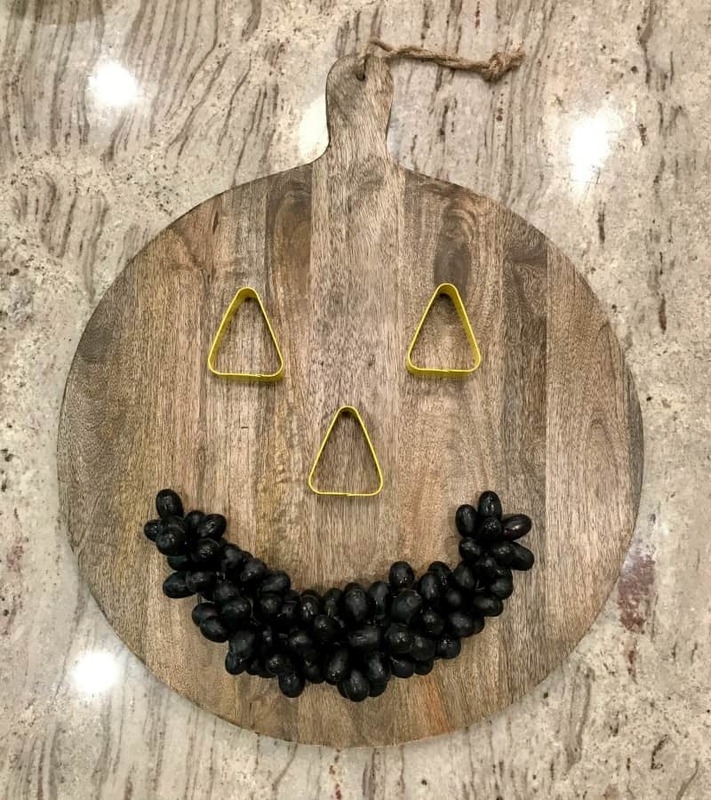 I used these candy corn shaped cookie cutters as place holders for the eyes and nose or you could use these or you could use any triangle shaped cookie cutters. I placed the cookie cutters down first, filled them with the black foods and then surrounded them with the orange foods before carefully pulling the cookie cutters up to leave the black foods in the triangular shape. Worked like a charm! For the mouth, I shaped black concord grapes into a smile. So darn cute! Below is an image with labels of all the foods I used to build the board. I got almost all of the goodies at Trader Joe’s except the Cheez-its, veggie straws and cheese puffs, but Trader Joe’s sells very similar items that you could use in place of these if you want to get everything from there. I just had these on hand, so I used them. I had the boys help me pick the orange veggie straws out of the bag of multi-colored ones and the orange candy corn popcorn out of the bag of candy corn popcorn as well as help me peel the clementines. They loved helping! 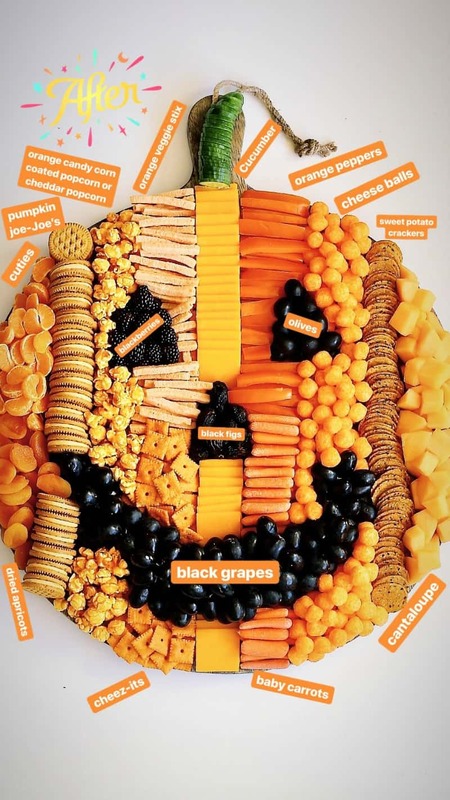 So I filled in all the black foods first and then started in the middle with the cheese slices and worked my way out with lines of the orange foods around the black foods. I just packed the foods tightly around the edges and they held in place just great as I transferred the board to the table to serve. Just one cookie fell into my hand as I was carrying it so I put it back in its place and we dug in! I wish I would have captured the kids’ faces as we were digging in, but I was too excited to dig in myself. 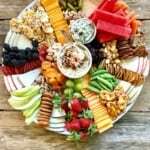 Such a fun and yummy snack board. We all loved it! My crew can’t wait to make it again for a Halloween or fall party soon. Have fun and enjoy!! 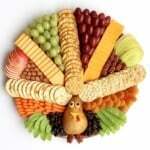 On a 20-inch round wood board, place three candy corn-shaped cookie cutters in place for the pumpkin's eyes and nose. Shape the black grapes into a smile for the pumpkin's mouth. Fill the cookie cutters with blackberries, black olives and black figs. 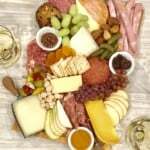 Start by lining the cheese slices down the middle of the board. Line the remaining orange ingredients out on both sides of the cheese slices and around the black foods until the board is completely covered. With the orange foods on the edge of the board, pack them tightly so they stay in place if you transfer the board to another location to serve. Carefully, lift the cookie cutters from the board, shaping the black foods back into the triangle shape, if necessary. 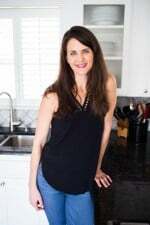 You can always add more black or orange foods to fill in any gaps. Place the thinly sliced cucumber at the top of the board in a bent shape for the pumpkin's stem.